Hidden inside of the dreamlike woodlands of mythology, the chipper notes of a pan flute float across the hazy air. And to the mind of an ancient Roman, this signified the presence of a faun, a bipedal creature with the lower torso of a goat and the upper body of a man whose head is often topped with horns. With their appearance borrowed from the Greek god Pan, it’s no wonder that the faun slowly became affiliated and confused with another Greek mythological beast, the satyr. And while these hybrid creatures were typically depicted as “wild and manly”, according to artist Seulgie Lee, her rendition of their form, the “Satyr Rory, is very soft and a lot cuter”. Evolving the design by changing the animal side, “like half-human and half-bunny, kitty, or bear”, Seulgie “felt that it needed its own name, so I named it Rory“. In fact, all versions of her creation now use that name. “They are all Rory“, she states, explaining that each animal’s name “goes before the name Rory, like Kitty Rory and Bunny Rory“. With her art toy creation garnering a strong following, resulting in two New York-based solo exhibitions, Starry Eyed (2016) and Puff Head (2017), the Satyr Rory seemed primed to take the leap from strictly being handmade to issued as a factory-produced art pieces. Then, in 2016, “a few Chinese companies started sending me inquiries” to do exactly that, Seulgie recalls. And even though partnering with “a big company was a very exciting thing to me”, she took her time to find the right fit, which ultimately was Pop Mart. Pop Mart, whose slogan is “Make Something Fun!”, “were already doing a blind box series with Kenny Wong at that time”, Seulgie explains, and they “were looking for a new character for another blind box series”. With the randomly packaged assortment of blind box pieces typically being on the smaller side, this immediately alleviated concerns that “there would be no difference between handmade and the factory-made” pieces, a possibility that she “wanted to absolutely avoid”. With the handmade renditions being “about 4½- to 5-inches tall”, Seulgie notes that these factory-produced versions are “about 3-inches tall”, which doesn’t seem like much, but she insists that they feel “a lot smaller than the handmade ones”. And the result of their collaboration was the recently released Satyr Rory Blind Box, Series 1. “The first series has four main sculptures”, according to Seugie, including “the very first sculpt, Satyr, I added bunny, kitty, and bear cub”. As she has “released handmade versions of each animal” previously, she states, “it was natural to pick them”. Perfectly capturing the details of her creation in these smaller factory-produced renditions, including the starry twinkles in their eyes, each of the main designs have been produced in three color schemes, meaning there are a total of twelve variations as well as “a secret design” randomly packaged in the Satyr Rory Blind Box, Series 1 containers. And with her Satyr Rory design continuing to rise in popularity, Seulgie is already looking to the future, considering new variations to create. 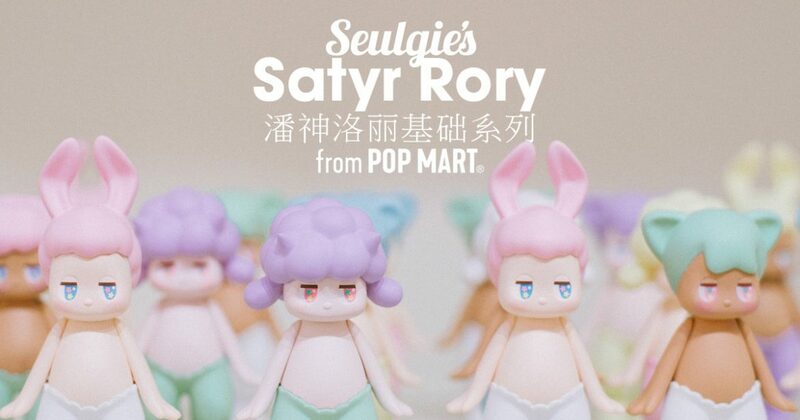 China-based collectors can acquire these pieces directly from Pop Mart, while those in other countries can reserve these pieces directly from Seulgie.